Rusty: Say, Wendy. Your chassis is a little scuffed. Mind if I polish it for you? The Linksys WMP300N is an internal PCI wireless card for a desktop computer. Designed to provide high speed wireless access to your desktop, this card boasts an external antenna that can be placed anywhere around your computer to help maximize the signal reception to your computer. As part of the current draft Wireless N standard, this card takes advantage of the latest wireless technology, Multiple Input Multiple Output or MIMO. With the MIMO technology, this generation of wireless can achieve speeds more than doubling the current rates found with Wireless G. However, it is also backwards compatible with Wireless G allowing you to receive and maximize on connections from an older router better than with a Wireless G alternative. The WMP300N offers reliable wireless access that takes full advantage of the internal workings of your computer. Rather than have to fool around with a USB device that often will take up the neighboring port as well, this adaptor becomes a fully integrated component inside your computer. With some internal wireless adaptors this can be a problem as it means the antennas are stuck to the back of the computer. Put it under a desk, sit in front of it and it can really degrade your signal reception. The WMP300N solves this with an external antenna with an extension cord long enough to allow placement of the antenna anywhere around your computer desk. The antenna itself features three separate individual antennas providing maximum reception from your access point. Being an internal component to your computer as opposed to an external adapter such as a USB wireless device, there is a slightly higher degree of technical skill involved. That being said, Linksys provides fairly detailed instructions for this adapter making it fairly easy to install for even the most basic of computer users. A few words of caution, always make sure that the computer is off and unplugged before adding and removing components. Also, make sure you are standing in an area free from extra static build up such as a carpet or rug. Static can discharge and damage your computer with a person not even able to feel it. Those warnings aside, if you follow the included instructions you should be just fine, but if you feel you need extra assistance look for either an unsuspecting relative that can help you, or a local computer repair shop that won’t charge as much as Best Buy. The actual install process is fairly painless. Linksys has to run their CD, shut down the computer, install the card, turn the computer back and finish the setup. From their they provide their own console for connecting to wireless networks, which is fairly painless so long as you know all the proper information for your home wireless network. If your wireless is provided to you by your internet provider they should be able to give you all of the information over the phone. Once the card is installed and configured you are ready to start taking advantage in the latest wireless technology. Again, Wireless N uses its MIMO technology to provide significantly faster data transfer rates over the previous G standard. Combine this with a Wireless N capable router to take full advantage of this technology and you will be rewarded with wireless that is a reasonable alternative even to a 10/100 wired connection, making this handy for people whose internet connection is not near their computers but still need a viable alternative to be able to get work done. 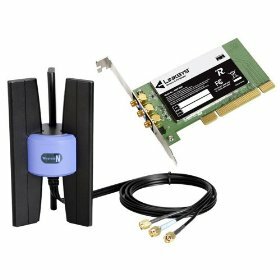 The WMP300N is a great choice when paired with or without a Wireless N router in terms of picking up signals and maximizing data transfer rates. was the longest range that this will go? I don’t think anyone knows how far wireless N will actually go, but we use it to shoot signals across the street, to a few blocks. It’s great for a multi-building LAN or if you need to shoot through trees. The only problem we have is interference from the street. The electrical systems from automobiles tends to lag the signal quite a bit.